Temperature. If your brooder is too hot, chicks will scatter away from the heat source, and if it's too cold, they'll huddle directly underneath it. Use your heat lamp to maintain newly hatched chicks at 95°F; after the first week, you can lower the temperature 5°F each week until the chicks are 5 weeks old. Excessive moving or handling. Shipped chicks are often stressed upon arrival, but you can reduce their stress by limiting unnecessary movement after they're settled into their new home. Pasting. Pasting occurs when the chick';s bottom becomes matted and plugged with excrement. Use warm water to gently remove the plug. Avoid lining the bottom of the brooder with potentially smooth surfaces, such as newspaper or wood, as a chick's inability to gain traction can lead to permanent leg damage. Instead, use a soft, absorbent litter made of textured cloth, such as burlap, or paper towels. In addition to poor overall health, improper feeding habits or using the wrong chicken food can lead to weak legs, breathing trouble, malformation and nervous system complications. Avoid scratch, table scraps and corn, which do not provide the appropriate vitamins, protein and minerals. Instead, for the first six to eight weeks, rely on a pre-mixed commercial chick-starter made up of approximately 20 percent protein. From nine to 20 weeks, a chicken grower feed is sufficient. 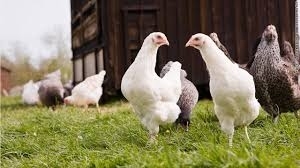 After 20 weeks, chickens should eat a laying feed such as laying crumbles or mash. Roundworms affect young chicks most severely, causing poor growth, intestinal blockage and death. Lice irritate chicks'; skin. Excessive scratching can lead to secondary infections and death. Mites can weaken young birds by sucking their blood, as well as cause irritation that can lead to infections. Fleas also cause irritation when they attach themselves to chicks. Use insecticides and keep your coop clean to help control pest populations. Additionally, thoroughly sanitizing the coop between each new group of chicks will kill any remaining parasites.